Why settle for a hotel when you can choose a vacation rental instead? Homely, affordable and with better amenities than most hotels can offer, vacation rentals are the ideal choice for travelers. Of course, not all vacation rentals are created alike. Here’s what to ask when reserving a vacation rental. Ask exactly what your rental gives you access to. For example, will you have the whole house to yourself, including the garage and yards, or do restrictions apply? Will you have wi-fi and telephone access? What fees, charges and taxes apply, and is a deposit required? Get a contract defining exactly what you’re entitled to in exchange for your money. Where exactly is the rental? Photos are a good guide, but they can be misleading. Get the exact address of the property and Google Map it to confirm that your beachside rental really is right on the water. You’ll also want to check that you’re close to shops, restaurants and main attractions (assuming that’s your goal!). What is the area like off-season? Traveling off-season is usually great for the budget, but you may arrive to find that everything is closed. Ask what to expect in terms of activities, recreation and food and dining so that you can better plan your trip. What recreation equipment is available for your use? If you’re staying near the beach, you’ll probably want access to snorkeling, diving and sunbathing gear. Ask the owner whether this equipment is available for your use – if so you’ll have a lot less to pack! Many vacation rentals are also equipped with book and movie libraries, too. Are cleaning services included in the price? While daily cleaning is the norm for hotels, not all vacation rentals have this option as part of their terms. Ask the owner whether cleaning is included in your fee, as well as how often a cleaner will come through. That way you’ll know whether you’re in charge of making your own bed! Who should I contact if something goes wrong? Be sure to ask for emergency contact details just in case an issue arises during your stay. Perhaps there’s a power outage, there are plumbing issues, or you get locked out. Knowing who to contact will ensure that these issues can be sorted out promptly. If you’ll be renting a car, you’ll want to know where and when you’re allowed to park your vehicle. In Placencia, golf carts are a popular option. Ask whether use of one is included or how (and whether) you should rent one. Some vacation rentals provide pick up services from the airport, and with others you are on your own. Be sure you know before you arrive what the transportation options are and make your plans! Is the property pet and child friendly? Ask about the vacation rental’s policies on pets and children. What kind of pets are allowed, and what are the associated fees? (Note, if you’re travelling internationally, quarantine might be an issue.) Is the home pet and child “proofed” with property and pool fences and stair railings? Ask about accessibility, activities and comfort for your pets or children. When do I need to check in and out? Vacation rentals generally aren’t staffed 24/7 like hotels are. When confirming your booking, know when you need to check in or out, and what to do if you arrive later than anticipated. You’ll need either a contact number to call when you touch down, or a secure place (such as a lock box) to collect the keys from. Get any codes or instructions ahead of time. Plans change, flights are delayed, family emergencies can arise. When booking your vacation rental, ask what the policies are if you need to cancel. How much notice do you need to give? What will it cost you? Can you re-book at a later date? What happens if the issue is a weather-related emergency? Planning a vacation and looking for the ideal vacation rental? 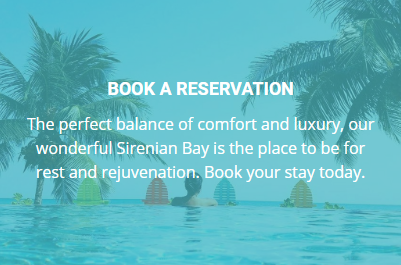 At Sirenian Bay, we have three Villas – Manatee, Seahorse, and Turtle – that function as vacation rentals. Take a look and check your dates – then come and see us!